The movie poster for "Throwback" a Yowie (Australian Bigfoot) monster movie. At the very least this movie gets props for creatively referencing The March of Progress (Rudy Zallinger, 1970), illustration used to visually depict human evolution. Just like the illustration, Throwback seems to be in a long line of Bigfoot movies that have only minor differences from it's immediate predecessor, but that would be unfair. Throwback is a pioneer, in fact, according to Bloody-Disgusting.com, it is the first movie about Australia's Yowie. We get most of Bigfoot movie news from horror websites. 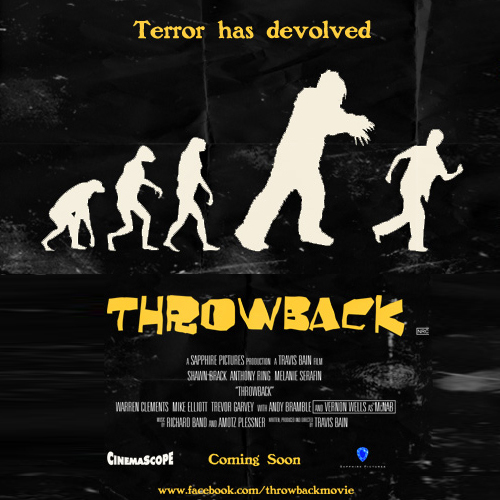 This is no different, today (01/04/13) Bloody-Disgusting.com announced the new trailer for the Yowie horror flick, Throwback. Throwback, which stars Shawn Brack, Anthony Ring, Melanie Serafin and genre film veteran Vernon Wells (The Road Warrior, Commando, Innerspace), is about two modern-day treasure hunters, a female park ranger and an embittered ex-cop who encounter a savage Bigfoot-like monster known as a Yowie in the jungles of Australia’s Far North. It is the first feature film ever made about Australia’s legendary cryptid. The film recently wrapped production in Cairns, Queensland, and is now in post-production. Two modern-day treasure hunters -- Jack ( Shawn Brack) and Kent (Anthony Ring) -- who go searching for the lost gold of a legendary outlaw in the remote wilds of Far North Queensland. But instead of riches, they find a different kind of legend, a ferocious Australian monster known as a Yowie, Australia's answer to Bigfoot, and a savage battle for survival ensues. Thrown into the mix are a park ranger named Rhiannon and an ex-homicide detective named McNab. Enjoy the new trailer below, which you have to admit has some amazing cinematography. The composition of some of these shots are breathtaking. The movie throwback looks like a good one. I will be eagerly waiting to see it. Do not want to see the movie it does not pertray Bigfoot I do not want to see it harm people.